This week: bringing the sun indoors, Lightpaper, and LED lamps that look like light bulbs. As the number of entrants offering SSL replacements for incandescent bulbs mushrooms, and as the big guys seem to consolidate their hold on the market through superior distribution, I have noticed that some of the new entrants are trying extra hard to look just like traditional light bulbs. One example is the Osram Sylvania Ultra LED bulb, discussed in this homeowner-oriented product review from The Gadgeteer. The larger bulbs, 75W and 100W replacements, look like everybody else's, with prominent heat sinks; in fact the 100W is in a sno-cone configuration. But the smaller bulbs approach the look of an incandescent, especially the 40W equivalent (pictured, right). The top part bulges out past the base sufficiently to give it a light distribution closer to omnidirectional than that of most LED bulbs. LEDs Magazine reprinted a press release from a company called Follett, out of Shenzhen, China. Their product (pictured, left) looks exactly like an incandescent, and claims, in the press release's broken English, to be omnidirectional. It is offered in 40W, 60W, 80W, and 100W versions with a five-year warranty. The Follett bulb is liquid-cooled. Perhaps they felt it's safe, from an IP perspective, to introduce their product in the US now that the Switch Light Bulb Company has exited stage left, pursued by creditors. Finally there is the 540-lumen offering from the English company Novah, shown above right. It is gas-filled and also claims an omnidirectional light distribution. The construction is glass and metal and its weight, at 44g, is nearly the same as an incandescent's. Novah's bulb only claims a 15,000-hour lifetime, though, and is warranted for two years. This startup from Idaho, just out of stealth mode, says it "prints light." 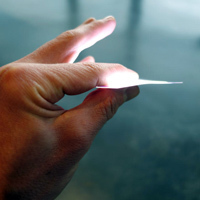 Its Lightpaper technology uses tiny LEDs (the inorganic kind) mixed with ink and printed on a conductive layer, then encapsulated. The company doesn't have many applications in mind yet, though their video suggests a few; they call Lightpaper a "platform" and hope that others will come up with creative uses for it. Lightpaper is far thinner than OLED, costs less, and lasts "20 years," according to Fast Company, for which I read 50,000 hours. This Kickstarter is happening: Sunn Light has already made its fundraising goal with 17 days yet to run. The product is a flattish 19" or 24" circle (48 or 61 cm) that brightens at dawn, changes color temperature throughout the day in accordance with the local sun's behavior, and dims and reddens at sunset. Sunn claims that the luminaire keeps within a minute of what the sun outside is doing. Of course there is an Android and iOS app, dubbed Sunn App; six different modes implement particular effects (e.g., Moonlight provides a night light when you shake the phone). You can still get in on the action: Sunn (19") Early Bird will set you back $289, and Sunn Plus (24") Earliest Bird goes for $349. Is the Switch Light Bulbs Company Dead?